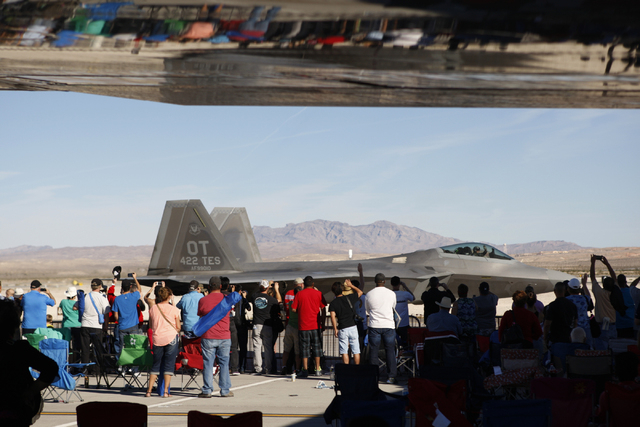 More than 75,000 people came to Nellis Air Force Base’s Aviation Nation show Saturday to see up close the fast, precision flying of the Thunderbirds and other aerial demonstration teams. 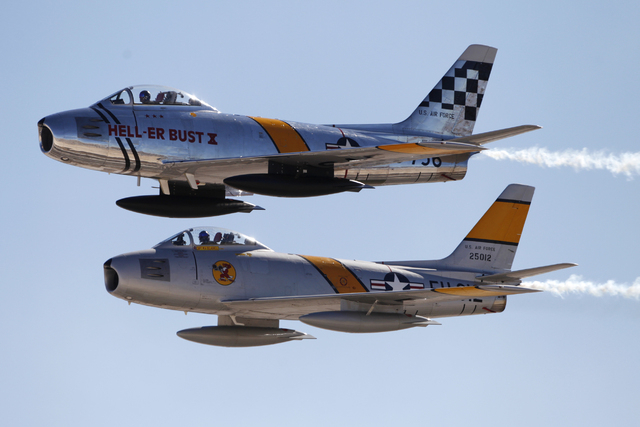 The feeling of nostalgia overcame former Airman Bill Irvin on Saturday as he watched military jets roar through the skies above Nellis Air Force Base. Irvin was stationed at Tonopah Air Force Station, more than 200 miles northwest of Las Vegas, 25 years ago. 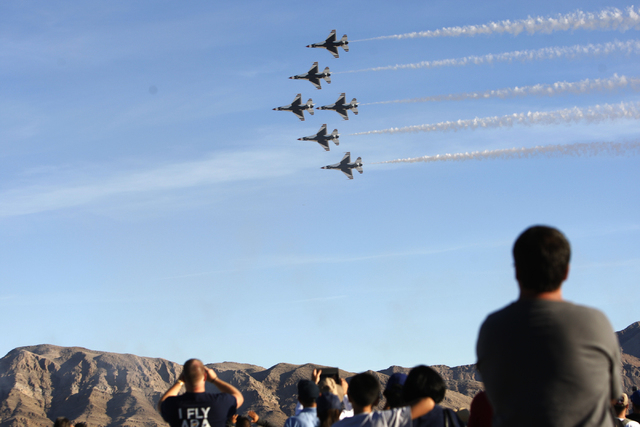 He said Nellis hosts one of the best air shows in the country. 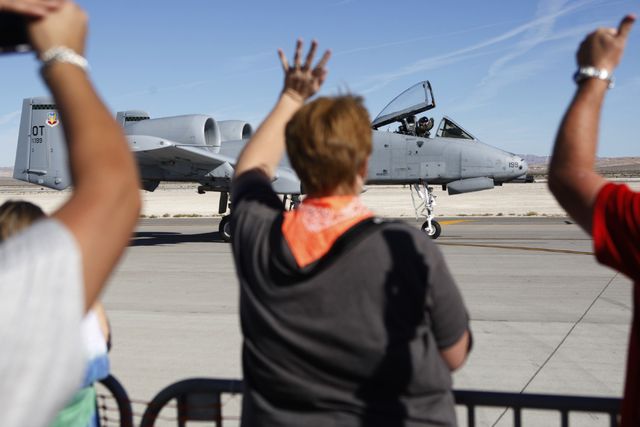 “This one is better because of the amount of people and the quality of the aircraft we get to see,” the 63-year-old Las Vegas resident said. 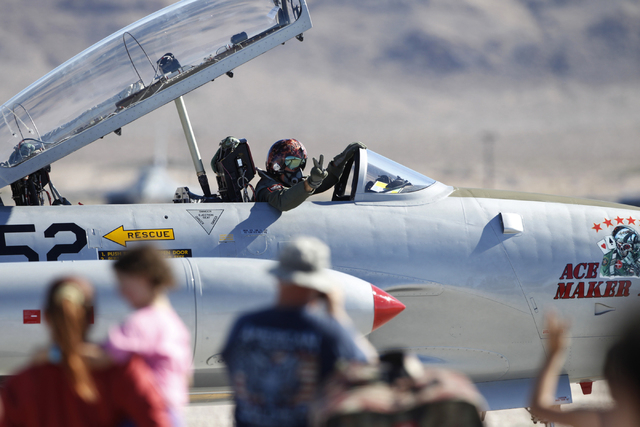 The first open house ever recorded at Nellis dates back to 1952. 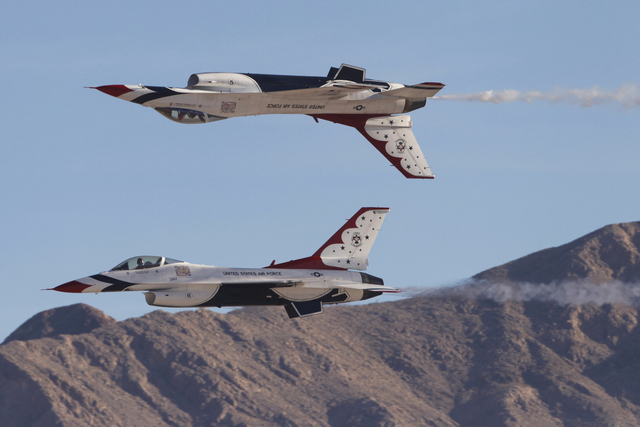 On Saturday, more than 75,000 people flooded the gates for a chance to see the aerial demonstrations performed by a variety of teams, including the most popular, the Thunderbirds. 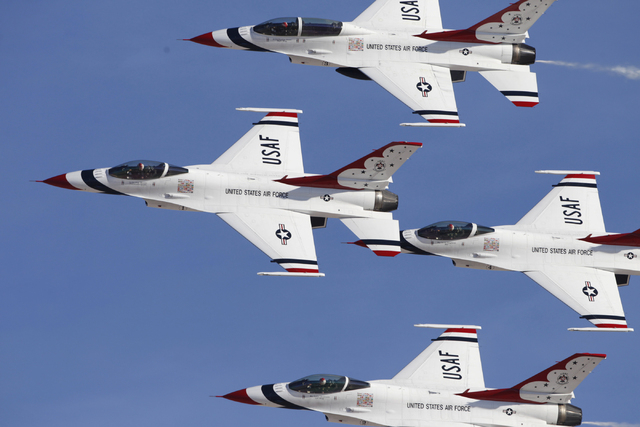 The Thunderbirds have been performing formation aerobatics around the world since 1953. 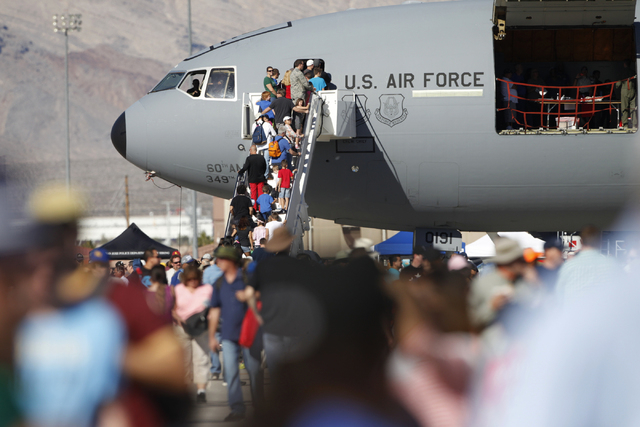 In 2012, Aviation Nation drew a crowd of 135,000 over the course of two days. 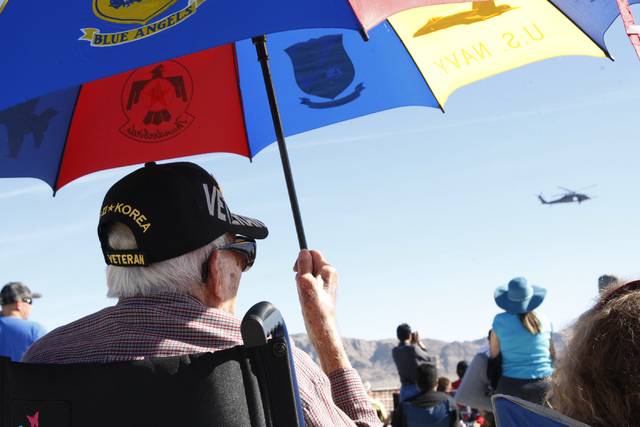 However, last year, Las Vegas was quieter around Veterans Day as the air show was canceled due to federal budget cuts. 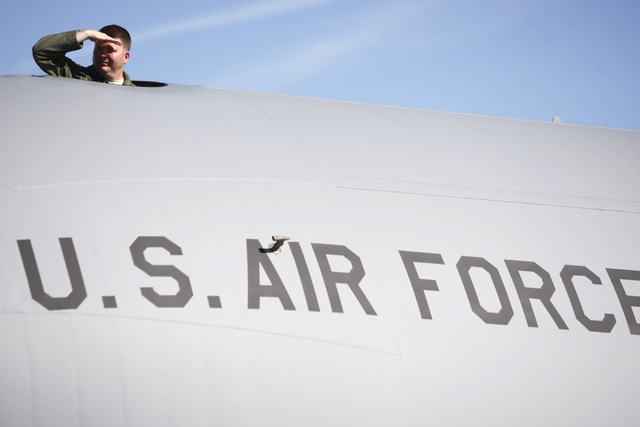 “I hope they keep getting the funding to host it because it’s great for the community to get an idea of what Air Force life is like,” Irvin said. 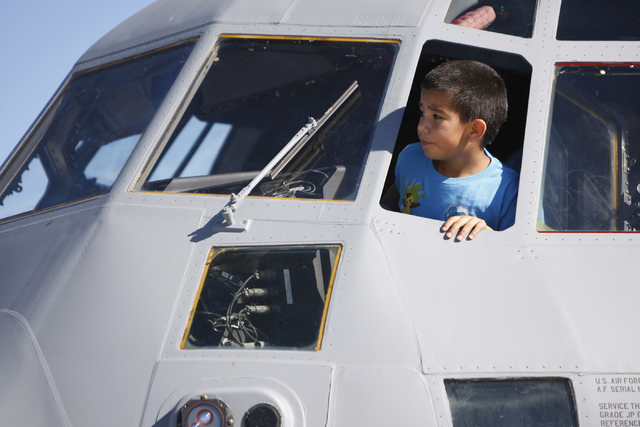 David Alfaro, who owns a welding and fabrication shop near the Nellis runway, brought his two grandsons and friend Carl Ditton to Aviation Nation. 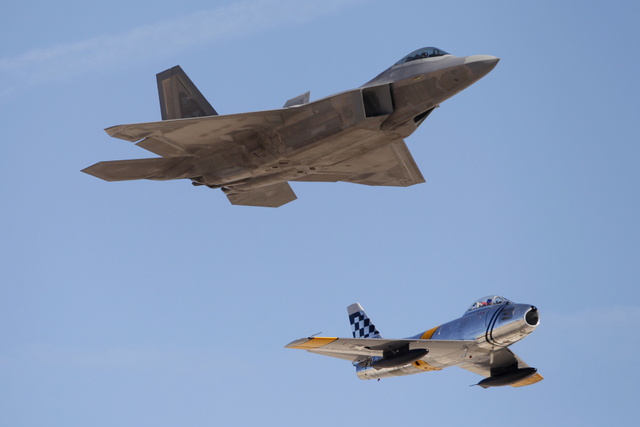 Air Force Pilot Travis Passey flies an F-22, a twin-engine, stealth tactical fighter aircraft, the world’s most advanced fighter jet. He said learning how to fly close together isn’t too difficult. He added that pilots don’t prepare much for the air show. 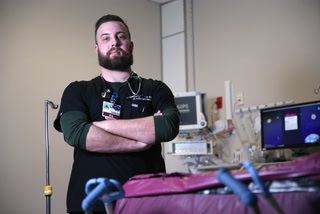 “Typically the pilots will talk and make sure they all know where to go but they do this all the time,” he said. 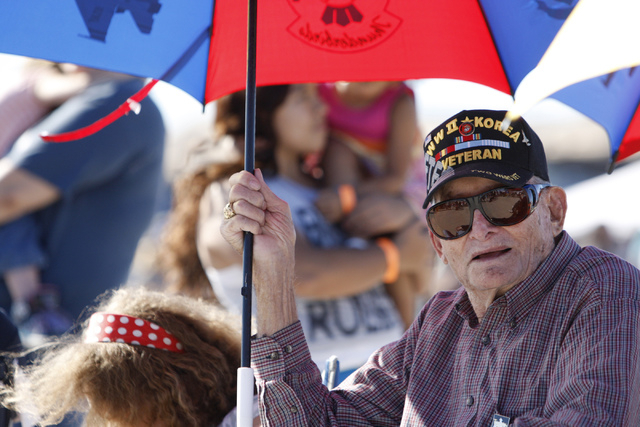 Christine Fulton of Las Vegas said she attends the air show to show support for the troops. 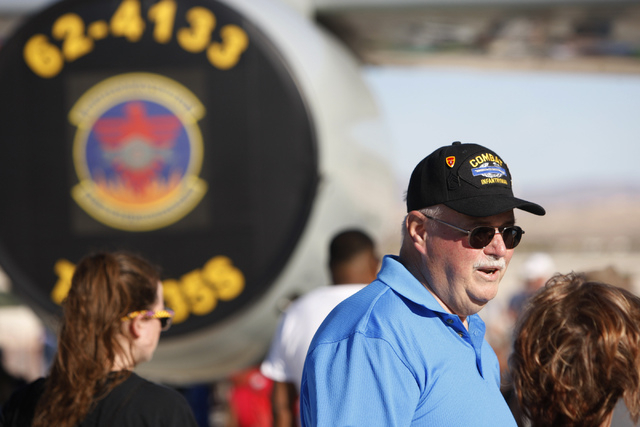 North Las Vegas resident Paul Green’s father was in the Air Force and he’s been attending Aviation Nation since 1967. 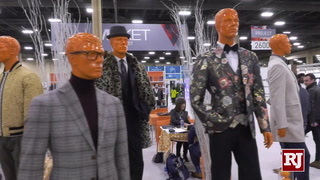 Though the show began at 11 a.m., many showgoers said lines of cars formed well before that and traffic was a nightmare. 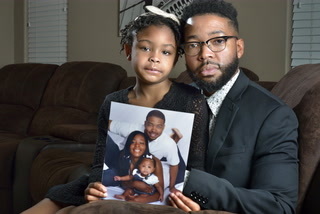 Destiny Williams of Orange County, Calif., said getting to Nellis took two hours from the Las Vegas Motor Speedway where shuttle buses were provided. 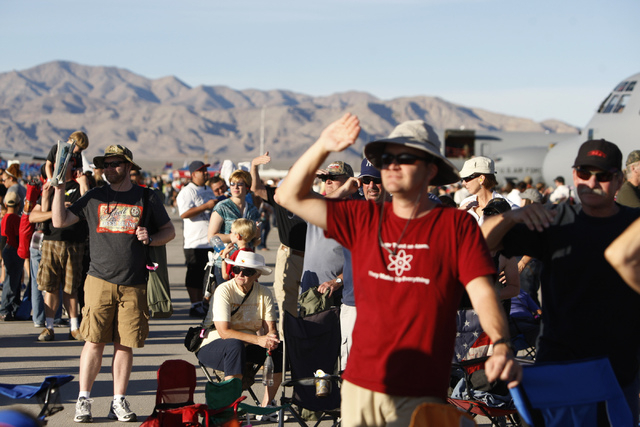 Williams said she checked the Nellis website for suggestions on what to bring. Hearing and sun protection as well as chairs were highly recommended. Food, beverages and souvenirs were available for purchase. 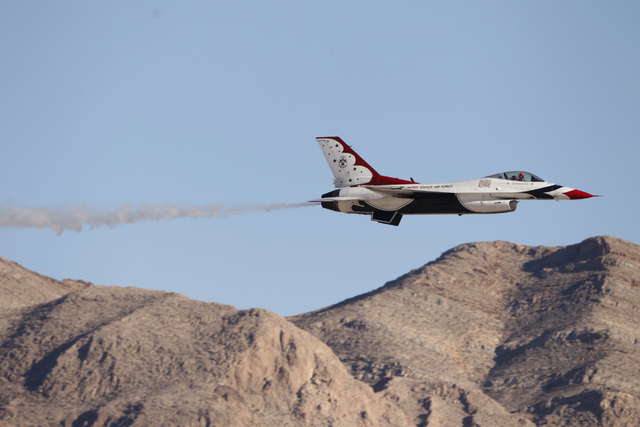 The airplane noise wasn’t out of the ordinary for North Las Vegas resident Brent Rich who said he lives 15 feet from base. Rich, a former Air Force staff sergeant, was stationed at Cannon Air Force Base in Clovis, N.M., from 1970 to 1974. “The planes keep getting better and better,” he said. Don Hagarty of Las Vegas agreed with Rich. He served as an adviser to a Vietnamese infantry unit for the Army in the late 1960s. 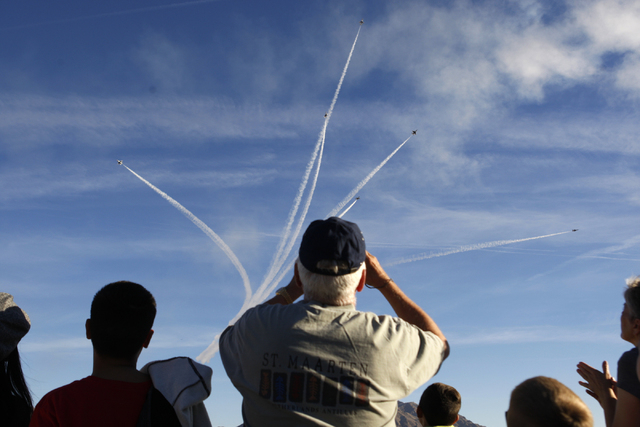 Hagarty said Aviation Nation was the biggest air show he’s ever seen. 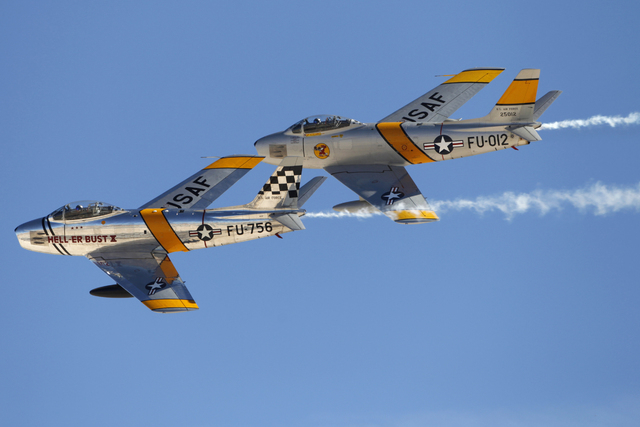 Day two of Aviation Nation is on Sunday from 11 a.m. to 4 p.m. Gates open at 10 a.m. Admission is free. The National Weather Service is calling again for clear skies, with a high temperature of 80 degrees. Contact Ann Friedman at afriedman@reviewjournal.com or 702-380-4588.